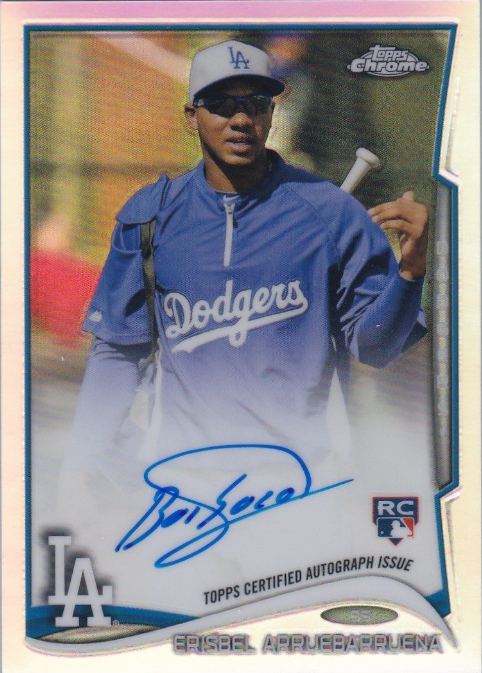 Here is a final look at some of the Dodger cards available in packs of 2014 Topps Chrome. This time I share the autograph and relic cards that are available. Go here to check out all of my past post on this set. Unfortunately, a couple of the cards have yet to show up, so I do not have photos of them yet. 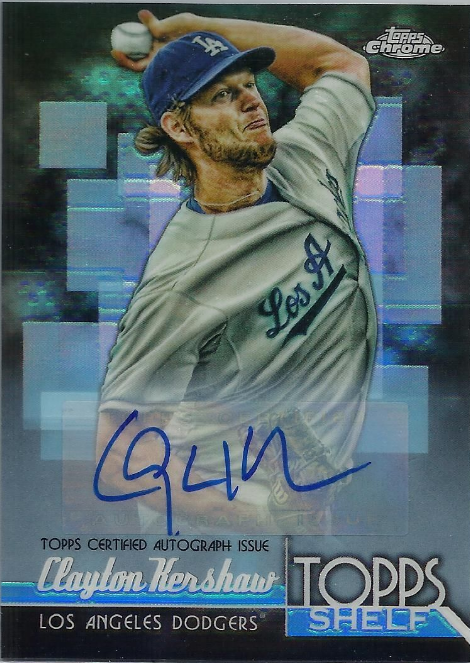 There is a Autographed Relic Patch Base Variation card of Clayton Kershaw (#100) that is numbered to only 10 copies, and a Chrome Connections Die-Cuts Relics card of Yasiel Puig (#CCR-YP) that is numbered to 25 copies. Manny Mota and Jaime Jarrin will be signing autographs for fans this weekend (both Friday & Saturday) at a Walmart in Panorama City for Kellogg's. Go here for information. 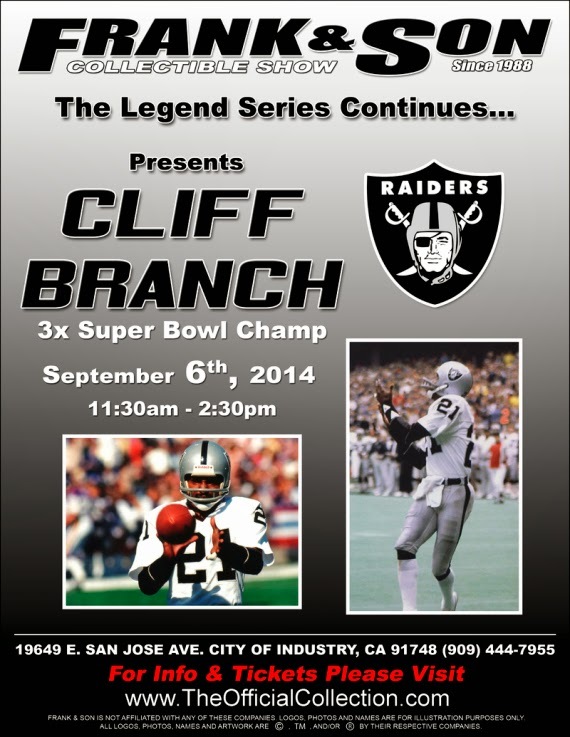 *Manny Mota will be at the Walmart on Friday, September 5th from 12:00 PM noon to - 1:00 PM. *Jaime Jarrin will be at the Walmart on Saturday, September 6th from 12:00 PM noon to - 1:00 PM. The Long Beach Expo opens tomorrow til Saturday at the Long Beach Convention Center. It is primarily a coin and stamp show, but there are a handful of card dealers in attendance. Go here for information. Free admission is available for Collectors Universe (PSA) members. 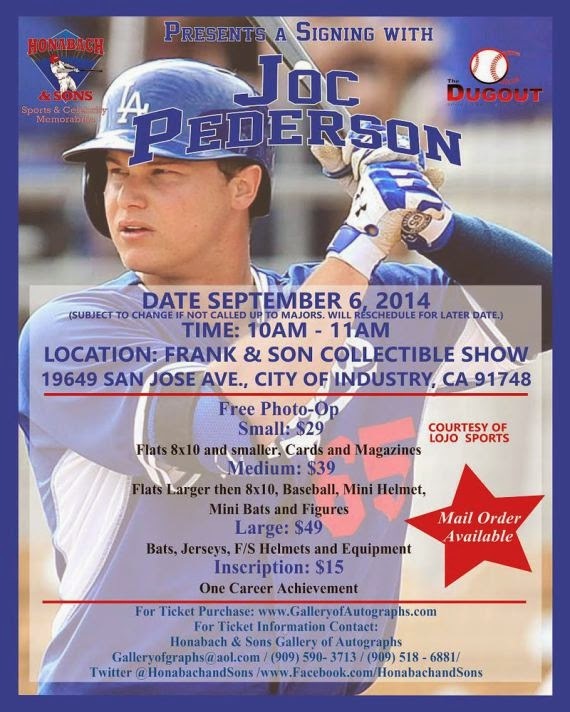 Dodger prospect Joc Pederson and former Raider Cliff Branch will be signing autographs at Frank & Sons in the City of Industry on Saturday. Check out the flyers below. You may also preorder Pederson autographs through the OC Dugout, here. Nothing Clayton Kershaw does should surprise you anymore. He is a master on the mound, and is unquestionably the best pitcher in Baseball. Last night he was sharp in eight innings, giving up three hits, striking out eight and allowed just a single run (on a home run by Bryce Harper). Kershaw now leads the league with 17 wins. The Dodgers offense knocked out eleven hits and scored four runs. AGon drove in the first run of the evening with an infield single in the fifth inning, then a subsequent throwing error scored another run on the same play. A couple innings later Juan Uribe slammed a two-run home run. Of note, Joc Pederson started his first Major League game of his career and recorded his first hit on a Texas Leaguer to centerfield. Check out my post from last night titled "Chronicles of Joc" for a complete rundown on his day, here. 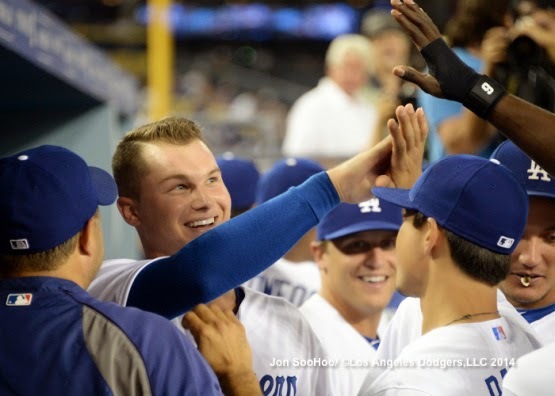 BTW, the photo above was taken by Jon SooHoo/LA Dodogers 2014. Go here to see more photos of his from yesterday; including pics of Little League Star Mo'ne Davis. On the 4 to 1 win the Dodgers maintain their 2.0 game lead over the Giants. Now, below are some links to check out. Via Jon Weisman at Dodger Insider, "Mo’ne Davis lights up Dodger Stadium." He shares a bunch of pics and videos of the young hurler. ICYMI: The Dodgers called up Erisbel Arruebarrena, Carlos Frias and Miguel Rojas as a part of their September roster expansion. BTW, Frias is expected to start this afternoon's game. Watch Buster Olney's interview with Clayton Kershaw at ESPN, here. Via Eric Stephen at True Blue LA, "Andres Santiago, Chris O'Brien win Southern League weekly honors." Ron Shah at FanGraphs shares a scouting report on Julio Urias and wonders, "Is Julio Urias Ready For The Big Leagues?" No... Come one now! Via Brian Macpherson at the Providence Journal, "Money can't buy success for MLB teams anymore." But more than at any time in the last decade, the relationship between payroll and wins is almost nonexistent. Teams that once could acquire the game’s best players through the depth of their pocketbooks now find themselves with diminishing opportunities to spend their money in ways that will help them win games. Denard Span of the Nationals explains his two home runs against the Dodgers on Monday, via the DC Sports Blog-The Washington Post. Roscoe's! The elixir of the Gods! Tim Dierkes at MLB Trade Rumors takes a look the "2015 Free Agent Power Rankings." Is there anybody there you would like to see in Dodger Blue next year? Via Tom Bartsch at Sports Collectors Digest, "Catching Up With Cardboard Pioneer Sy Berger." Berger was the top dog at Topps during the golden years of Baseball card production. The Los Angeles Kings just released their promotional schedule for the upcoming season. Check it out here. BTW, Dodger Night will on Tuesday, November 18th. Other must attend games include replica Stanley Cup ring night on Thursday, October 16th and Opening Night, Wednesday, October 8th, to watch the Sharks sulk as we raise our Stanley Cup Banner! I am sad to report that there will be no bobbleheads. Boo!